Supported by the UCLA CFAR. It is essential for researchers to keep abreast of the work being done by colleagues in a variety of disciplines. 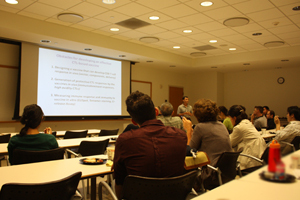 To facilitate this, the UCLA CFAR sponsors a weekly conference featuring presentations made by researchers working in both basic and translational sciences, clinical therapeutics and biomedical prevention. The topics covered include, among many others, novel therapeutics, vaccines, stem-cell research, aging, and viral pathogenesis. If you are unable to present at the lab meeting for which you are responsible (barring emergencies), please make every effort to arrange for another Lab Meeting Presenter to take your place. After you have changed your schedule, please contact Melody Li and/or Oliver Fregoso to inform them of any changes you have made at least one week prior to your scheduled meeting. The Grand Rounds lecture series consists of hour-long lunchtime lectures, delivered by invited guests or distinguished members of the Institute faculty. The aims of the program are to highlight important developments in AIDS-related research, encourage collaborations between UCLA investigators and invited speakers, interest young investigators in AIDS research, and provide information about new findings and funding opportunities.